There are more than 20 Blissus species native to North America but only four are reported pests of turfgrass: the common chinch bug (Blissus leucopterus leucopterus Say), the hairy chinch bug (Blissus leucopterus hirtus Montandon), the southern chinch bug (Blissus insularis Barber) and the western chinch bug (Blissus occiduus Barber). 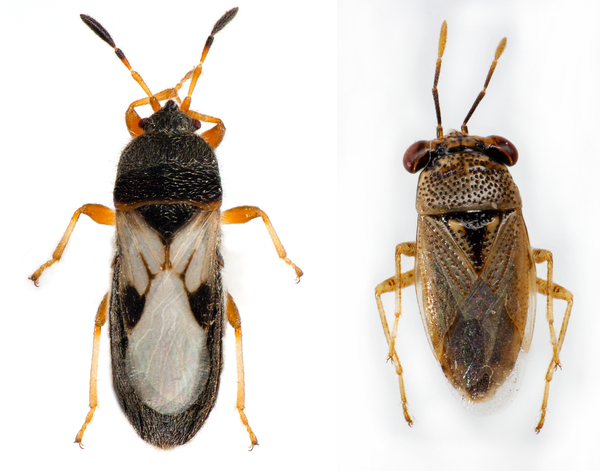 Of those four species, only the southern chinch bug is a common turfgrass pest in the Southeast. Southern chinch bug adults are oblong, oval, and black with shiny white wings; each wing bears a distinctive, triangular black mark. They are approximately 0.1-0.2 inch long. Adults look similar to, but should not be confused with, big-eyed bug adults (Figure 1). Nymphal instars are smaller (0.04-0.1 in) and change in color and appearance as they develop. First and second instars are bright orange with a white band across the abdomen. As they grow, later instars darken to orange-brown, dark brown or black and wing pads start to appear (Figure 2). Southern chinch bugs are most commonly reported as pests on St. Augustinegrass but can also infest centipedegrass, zoysiagrass, bahiagrass, torpedograss, pangolagrass, and bermudagrass. Southern chinch bugs are primarily more of a problem on thick mats of turf in sunny, open areas. Females lay around four eggs per day in leaf sheaths, thatch, and soft soil and can lay up to 250 eggs in a lifetime. Eggs will hatch in 1-2 weeks and nymphs complete a series of five molts before maturing into adults. Chinch bug populations in the southeast are active year-round, with the occasional winter season dormancy period for adults when conditions are cold. As a result, chinch bugs generally do not leave their feeding ground and remain sheltered around the roots and base of St. Augustinegrass. During the warmer months, populations could have 7-10 overlapping generations. Nymphs and adults cause damage by sucking fluid from a turfgrass plant. As they feed, a salivary secretion can be injected into the plant which interferes with water and nutrient movement which causes the plant to wilt and discolor (Figure 3). Winter frost and drought damage can sometimes be mistakenly diagnosed as southern chinch bug feeding in the spring. The southern chinch bug thrives during warm, damp periods and infestations generally peak in early July. Good cultural management can reduce the need for chemicals. Thatch can provide protection for chinch bugs and impede the movement of pesticides through the turf environment so be sure to observe proper mowing, fertilization, watering, and specific lawn care practices for St. Augustinegrass to minimize thatch (see St. Augustinegrass Lawn Maintenance Calendar). If possible, in areas of high pest pressure, avoid planting the 'Raleigh' variety of St. Augustinegrass, which is highly susceptible to chinch bug damage. 'Floratam' and 'Floralawn' varieties show varying degrees of resistance, however, they lack cold-hardiness. Check with your county Cooperative Extension office to see how these varieties perform in your area. Cool, cloudy weather promotes fungal pathogens which attack chinch bugs and keep populations low. Proper irrigation can help reduce the likelihood of chinch bug damage. Chinch bugs are attacked by several predatory insects. Apply insecticides only when necessary since the repeated use of chemicals on a lawn may reduce the number of beneficial insects present. If you suspect you have a chinch bug infestation, part the grass at the edge of the affected (yellowing, wilted) areas and examine the soil and base of the turf. Be sure to check in several places. You should be able to see chinch bug nymphs and adults crawling around the disturbed turf. Another sampling method is the “plastic bag” technique. For this, you place and seal a large square of turf in a sealable, clear plastic bag. Place the bag in the sun for several minutes. As the bag heats, insects will leave the turf and collect on the inside of the bag where they can be counted. An approximate treatment threshold is 20-25 chinch bugs per square foot. If the problem is localized, spot treatment of off-color turf and around the perimeter of the affected spot is appropriate and preferred. Specific recommendations for commercial control and home lawn can be found in the North Carolina Agricultural Chemicals Manual. chlorantraniliprole (Acelepryn) 0.184 to 0.46 fl oz Suppression. bifenthrin* (Menace, Talstar, others) F, GC; G form also available 0.25 to 0.5 fl oz Use GC formulation for golf courses. chlorpyrifos* (Dursban), 2E, 4E, 50 WP, Pro See label For use on golf courses; check new label. cyfluthrin (Tempo 2) 0.2 fl oz Home lawns only. lambda-cyhalothrin* (Battle, Scimitar, Cyonara) See label Do not make applications within 20 feet of any body of water. No reentry until spray has dried. dinotefuran (Zylam) 20SG 1 oz per 1,000 ft2 For suppression. Carolina Lawns: A Guide to Maintaining Quality Turf in the Landscape. Bruneau, A. H., et al. editors. 2008. NC State Extension Publication. AG-69. Chinch Bugs in St. Augustine Lawns. Merchant, M. E. and D. A. Mott. 2006. Texas A&M AgriLife Extension. Publication E-420. 5 pp. 2018 Pest Control for Professional Turfgrass Managers. Bowman, D. et al. 2017. NC State Extension Publication AG-408. Managing Southern Chinch Bug in Warm Season Turfgrasses. Buss, E. A., B. M. Whitman, and A. G. Dale. 2018 (revised). University of Florida EDIS.